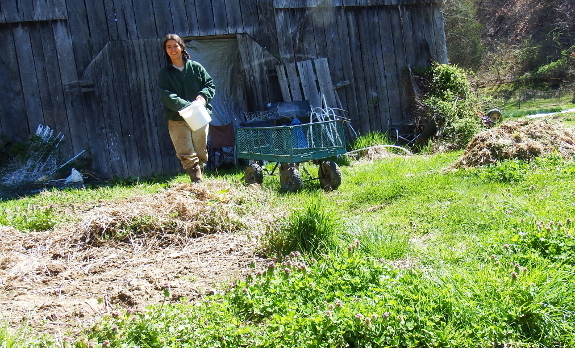 Over the winter, I took topsoil from the beds close to the barn and the woods on either end of the mule garden and created a new bed in a sunnier spot. That left me with several patches of bare subsoil which are kinda-sorta an erosion risk. Not really since they're surrounded by solid sod...but the bare patches still offended my ecologist's eye. So I decided to seed them in goat-fodder crops so Artemesia and kid(s) can graze in the shade while I weed the mule garden. Sounds like paradise in the making, right? Will the fast-growing oats overpower the slow-growing clover and make the legume seeding worthless? Will spring oats suit our goats' palates as well as fall oats do? You'll have to come back this summer to check out the answer to this nail-biting, homesteading cliffhanger. For once I know something about this! Anna, growing up in God's Country (Minnesota lol!) alfalfa and clover were grown for hay and haylage (hay chopped green and put up in a silo to ferment, cattle feed) and it was customary to plant these crops along with Oats as a "nurse crop". 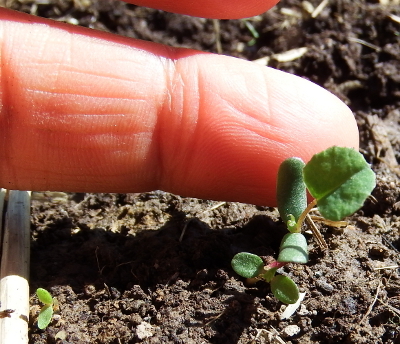 As the tender shoots of Alfalfa or clover would quickly get over run with weeds. Crops were seeded in a grain drill, which essentially sows the seed in tiny rows a couple inches apart that become a solid stand. The seeds were in separate bins with separate seed meachanisms, as the way the seeding mechanism works the hole big enough for oats to go through would quickly over seed the tiny alfalfa or clover seed. The oats would grow quickly and shade the alfalfa until it got established. In the upper Midwest climate, the oats (or barley or such) would mature and be harvested for the grain in late summer. The next season you would have a good stand of alfalfa. So to answer your question, I think that after the oats mature you can mow them down and you will find the clover will spring up from the stubble. Eric --- I'd actually read about that method, but wasn't too pleased the first time I tried it. However, I now think that might have been my annual gardener's need for immediate gratification at play. When I go look at the pasture where I seeded clover and oats together many years ago, now I realize it's chock full of clover. So maybe those Minnesota farmers know what they're doing after all!